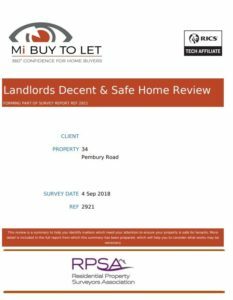 Buy-to-Let surveys are a new type of survey, designed to give landlords and investors a clear understanding of the property they are intending to buy. They involve a thorough investigation of the property’s condition, identifying items that may impact potential tenants so you are aware of where any problems are and where issues may occur in the future. The aim of the Buy-to-Let survey is to help you make an informed decision about proceeding with the sale by considering the potential repair costs on top of the property’s asking price. WHAT DOES A BUY-TO-LET SURVEY INCLUDE? Inspection of the property’s associated services – heating, electrics, boiler etc. In addition, your report will include an investigation of the property’s grounds and boundaries, advice relating to the EPC (Energy Performance Certificate), and any relevant legal information from Planning and Building Control, the local Council or the Listed Building register. Having worked as a surveyor in Hertfordshire, Bedfordshire and Buckinghamshire for over 30 years, Alan Rance carries out all types of property survey with an extensive understanding of common local issues. Providing a high-quality service at competitive prices, Alan is dedicated to helping buyers in Tring, Dunstable, Leighton Buzzard and the surrounding areas, find the perfect property. To find out more information about Buy-to-Let Surveys, EPCs or any other related services, please get in contact.